The one problem with the turntablist as a member of a band is that they are stuck at the back, restricted by a heavy pair of turntables which require stability to work efficiently. However, for the last 10 years one inventor has been fighting to bring the turntablist into the foreground. 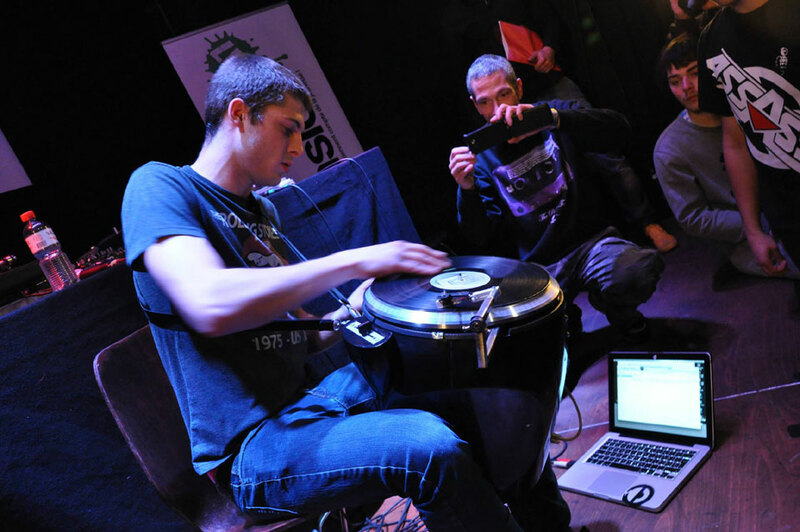 44-year-old French innovator and DJ, Thierry Alari, came up with the Scratchophone in 2000. 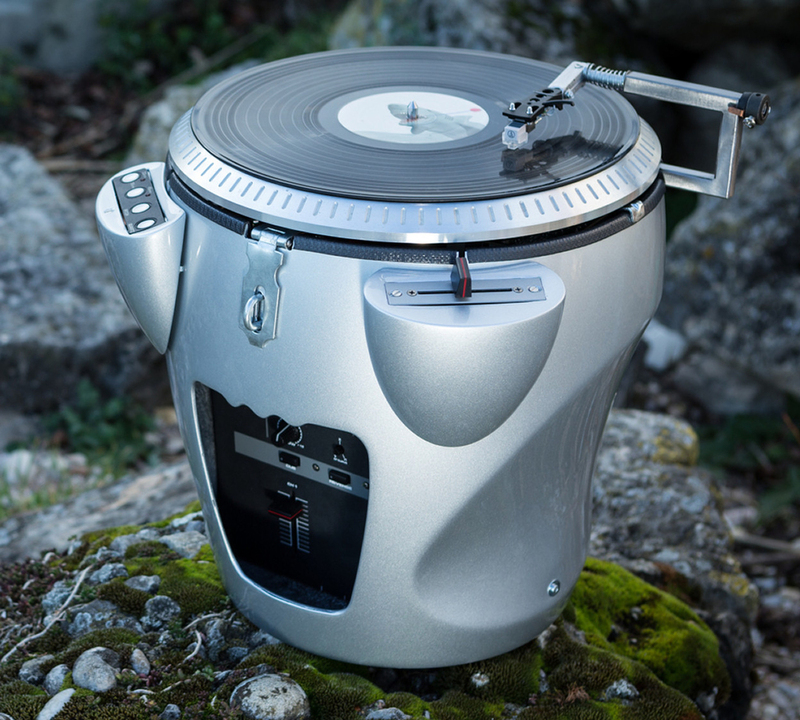 Inspired by Vestax's own version of the independent turntable - the QFO, he wanted an instrument that the turntablist could walk around with, even busk with. More manoeuvrablity equals more freedom. Although the Scratchophone has never found a major company willing to mass-produce, Thierry still operates on a made-to-order basis and has made around 40 up to now. We spoke to Thierry to find out his thoughts on his invention after 10 years of making them. What have been the challenges, how the hell does the tonearm stay on the record, and will there be any more instruments like it in the future? So the scratchophone was first featured in Endgadget in 2005, how has the instrument changed since then? This very first functional prototype already had all the parts: a portable drum-shaped shell, turntable, mixer, external cross-fader, speakers and a special tonearm for skip-proof vinyls only. For 10 years, I just focused to improve them, one by one. What originally inspired the invention? How was it developed and how long it did it take? Do you have an engineering background? Absolutely not, that was part of my personal challenge, studying design how-to, learning step-by-step, especially with moulding techniques. Beyond technical design issues, I had to learn about a business plan as well. How does the tone-arm work and how difficult was it to design? The cartridge is simply spring-loaded. After many trials, I ended up with a simple and functional tone-arm. The main issue was to be able to build it myself with classic tools in my garage. I didn't want to outsource it and finish with a super-expensive piece of metal. Moulding is quite difficult: materials and techniques are time/money-consuming, supposing you already know what to mould...I spent many months learning and designing the drum volume shape with 3D software. How did you decide on the components? I'm upcycling components, they already exist and I had to put best of them in a new way. The scratching key features are simple: the best torque turntable and a crossfader solid as a tank, others details are secondary. Can you plug it into its own amp, like an electric guitar? Mixer inputs and outputs are classic ones. So yes, you can plug it into any external amp. But as it is portable, I wanted a all in one unit (turntable, mixer and speakers). The idea is to go outside your bedroom and meet others musicians, so you can have new musical fusion experiences.That's why I insisted on having a built-in speaker, to be able at least to play with others' acoustic instruments. How has the reaction to it been since it first appeared? Did people need convincing? People's reaction has always been incredibly positive, even if prototypes were crappy...The concept was cool and promising but at one point you need to bring some proofs to convince. Since you began, DJ controllers have become more and more prevalent. Did you consider remaking with a control pad instead of a turntable platter? Are you seeking investment on this or are you happy to work as a custom manufacturer? I'm not looking for any investment at the moment. My way of working is step-by-step only. Scratch gear market is a niche of a niche ... probably a growing one, but still a niche. The mass production model is not for me. Custom manufacturing is a human-size business - much more interesting. How much further can the instrument develop? Will new features be added in the future? I always invite customers to ask for new features (built-in looper, FX pads etc.) Scratchophone's size and weight can be optimized but technical features won't change so much. Do you think it will ever be possible to create an acoustic scratch instrument? I would love to have at least a practice gear. Imagine a entirely mechanical one: crank drive and electrical autonomy. Definitely feasible. The problem is that gear should be not expensive, so low margin and mass produced. Not for me. What about some kind of hybrid between a guitar/piano/accordian! and a crossfader? Scratching is new musical practice (just 30 years old) and we just need a simple and efficient scratch instrument. There's already a lot to do with it... Playing together with other musicians would already be great. Bizarre DNA cross-over with others' instruments seems to me useless. Any other inventions in the pipeline? No, just looking for a scratchophone digital solution. The most interesting way at the moment would be to upcycle controllers with a real spinning platter (Denon 3700/3900). I'm building one for a Russian customer, but it is not a Scratchophone anymore, just a mod controller with a built-in mixer to be played in a vertical position (like a guitar). Not my cup of tea, but I will build it.